In its summary of Work Related Injuries in Colorado, the Colorado Division of Workers’ Compensation reported that knee injuries accounted for 3,263 workers’ compensation claims involving missed days of work in 2008. These knee injuries include knee dislocations, torn cartilage, osteoarthritis, fractured knee joints, ligament injuries, tendon injuries, a hyper-extended knee and a torn meniscus. If you suffer from a knee injury, meniscus tear or other damage to the knee, it is very important to contact an experienced Boulder Colorado workers’ compensation attorney for assistance. Your attorney can help you to take action against your employer and recover compensation for the medical costs of treating your knee, as well as payment for lost wage and temporary or permanent disability benefits. 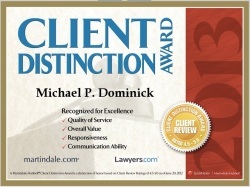 At The Dominick Law Firm, we have helped countless clients with knee injuries to receive the full compensation they deserve under Colorado law. Contact us today at 303-447-2644 for a free consultation to learn how we can help you. A torn meniscus is the most common knee injury and, according to the Mayo Clinic, can be caused by “any activity that causes you to forcefully twist or rotate your knee.” Many of the activities performed at work can force you to twist or rotate the knee and cause this damage. For example, the Liberty Mutual 2011 Workplace Safety Index lists the top 10 causes of disabling workplace injuries and includes overexertion, falls, repetitive motions, and bodily reactions to twisting, bending, turning and other movements. In these and many other situations, it is possible for you to tear your meniscus or to cause other damage to your knee. When you damage your knee, you may simply require rest, relaxation and treatment with non-steroidal anti-inflammatory medications (NSAIDS). However, in other instances, the problems you experience may be much more serious and you may be required to have knee surgery to correct medical issues or complications. Damage to your knee can also significantly limit your ability to move around at all, much less to perform work tasks that require any type of exertion. Your employer should be responsible not only for your medical costs, including physical therapy and any necessary surgery, but should also be responsible for paying partial lost wages benefits and for paying disability benefits if your knee injury renders you unable to work either temporarily or permanently. If your knee injury doesn’t leave you totally disabled but requires you to cut down on your work duties or shift to a different job, your employer should attempt to make accommodations to find lighter duty work and/or should compensate you for any reduction in your wages as a result of the knee injury. Unfortunately, employers will sometimes attempt to claim a knee injury was not work-related, especially if the injury develops over time or you do not realize right away that you have injured yourself. Getting prompt medical attention as soon an accident or injury occurs or as soon as knee pain develops is essential to proving your workers’ compensation claim. Hiring a workers’ compensation attorney is also a smart choice as your Colorado workers’ compensation lawyer can help you to prove your right to full benefits available under the law. The Dominick Law Firm can help you to prove your knee injury- torn meniscus was a direct result of your work-related tasks and that you should be entitled to benefits under Colorado workers’ compensation laws. Our Boulder workers’ compensation firm has assisted clients with workers’ comp claims throughout Boulder, Thornton, Longmont, Louisville, Lafayette, Erie, Broomfield, Lyons, Mead, Loveland, Wheatridge, Greeley, Ft. Collins, Superior, Denver and the entire Colorado Front Range. If you live in this area and need assistance understanding or enforcing your rights after a knee injury, contact us today at 303-447-2644 or using our online form to schedule a free consultation to learn how we can help.